In 2016, a new global framework of seventeen universal and inter-linked Sustainable Development Goals (SDGs) came into effect. The SDGs build on the achievements of the eight Millennium Development Goals (2000-2015). The SDGs encompass a range of ambitious commitments to be realised by 2030 on ending poverty and hunger worldwide and ensuring minimum global standards in relation to health, education, decent work, clean water and energy, sustainable communities, consumption and industry, climate action and environmental protection. 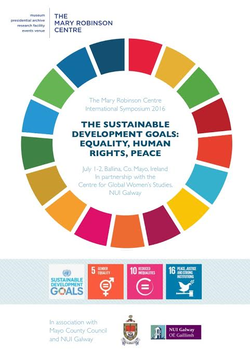 In this important first year of the implementation period of the SDGs (2016-2030), The Mary Robinson Centre International Symposium 2016 brought together key stakeholders who have interests in promoting equality, human rights and women’s participation and leadership in the implementation of the seventeen SDGs. In doing so, it sought to foster action-oriented links among policy decision makers, inﬂuencers and implementers; academic and policy researchers; practitioners in development, humanitarian and human rights NGOs; and others committed to the implementation of the Sustainable Development Goals. ​Recordings of the Plenary Sessions can be viewed here.